On Thursday a friend of mine went to eat japanese food and we decided to go to the Japanese market, we got some nice stuff, so I will show you what I bought. Ok so I also dragged her to the japanese bookstore, and bought the April issue of Popteen with Tsubasa on the cover. I've been flipping throught the pages and I love it. I can't read japanese but because they have tons and tons of images it is pretty easy to get a sense of what they are saying. Tutorials are super easy to follow. Anyways my favorite article has been this. 100 outfits based on certain spring color. Obviously this is the blue pages. Erasers were $1 each, the soccer ball is my boyfriend's. He got very excited when I gave it to him lol. Daiso eyelashes, I love them, only $1.98! Diamond lashes, these are "the dolly eye", I've been enjoying my diamond lashes from my last haul, that I decided to try out these. Also got this Kamipita hair velcro thing. It is to hold your hair while you do your makeup. I wanted another color, but this was the only one left, so because I was only going to use it at home it didn't really matter what color it was. Super kawaii chopsticks! I don't even know why I got them, I don't even know how to use them. Lastly, this pack of strawberry pocky! gotta love it. Apparently I'm late on this trend. I was googling about it and found some articles dated from 2010. It's about the fox tail keychains. 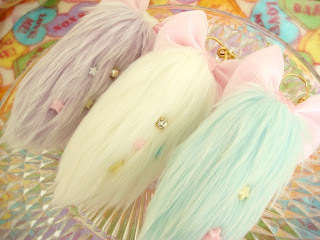 Recently I have seen the fox tail keychains on the Japanese magazines, and I love the way they look. I think it is a fun way to accessorize your purse. I've seen the whole accessorizing your purse with a scarf, and small keychains, but I don't like the way that looks, so generic, like something an older woman would do. 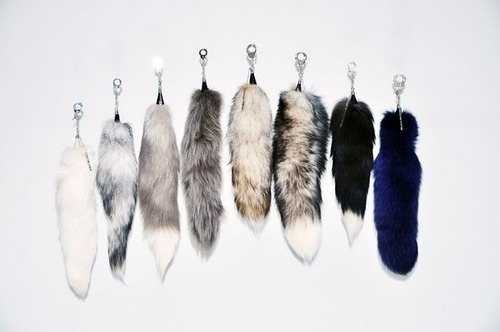 The fox tails look very playful, and they come in many colors and patters, they are so unique. 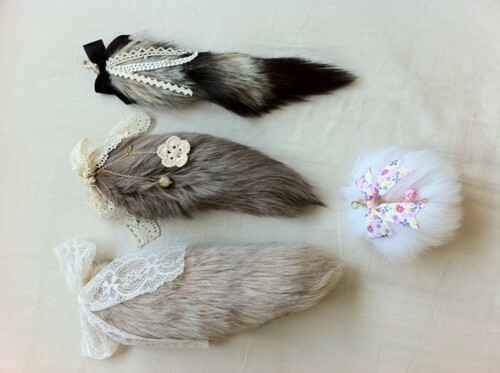 The best of all is that I have seen some pictures of customized fox tails, and they look even cuter!. I actually purchased one from ebay on sunday, but I haven't received any updates from the seller, ugh. I hate when sellers do that, I mean, if the buyer pays for the item immediately, you shouldn't take forever to drop a package to the post office. Anyways, I purchased a white one, and it is faux fur, because I find it a bit creepy to have a real fox tail. The majority of real tails that are on ebay are around $15 USD and come from China, but I really wanted to abstain from buying from China because from what I've seen from videos they are very cruel to animals, they litteraly peal their fur from their skin while the animal is still alive! Buying faux doesn't hurt anyone right? Faux is actually cheaper too! So what do you think about the fox tail keychains? I don't know if you guys remember the 3-D nail stickers I bought the time I went to the Japanese market. I actually hadn't had the time to use them until last week! I'm posting this so late because I couldn't find my camera cable. They are super pretty!, sadly they only lasted me three days because I used a terrible topcoat. The fact that I also do a lot of typing all day didn't help as well. The color I used as a base was Milani Beachfront, which is beautiful. Pastel blue with silver shimmers! Milani polishes are very good, they have a great selection of colors and they are cheap. So these are the nail stickers and still have for another manicure... yay! The other day I found out that Pretty&Cute is selling these stickers, so I leave you the link in case you guys are interested. The only thing I don't really like about the stickers is that you have to be very careful when applying them because if you misplace them on your nail, you won't be able to get it off. I'm so happy because now I own clothes from Liz Lisa! For the people who don't know about Liz Liza, it's a Japanese gyaru clothing line. Everything, it's so pretty and cute! also expensive. The thing about Liz Lisa, and other Japanese brands is that they don't ship overseas, so people like me who do not live in Japan, can't really get the products unless, they have family or a friend in Japan (which I don't) or use a shopping service, the one I used was Tenso.com. which is advertized on the Liz Lisa website. So, I purchased a fukubukuro ( translates into lucky bag, or mystery bag). 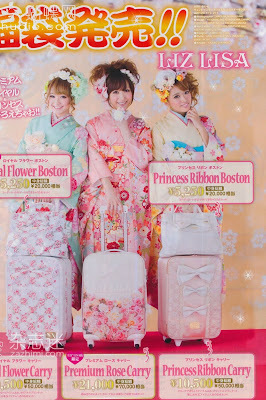 In Japan they have a tradition that during the new years eve they would sell these bags filled with goodies from the store. The catch? the value of the contents surpasses the price, and you don't know what you will get. So yes, they are very popular. I'm blogging here about a product that came out in December, but I purchased it in February, but my bag got stock in Customs for a month! The One I purchased was the Princess Ribbon Boston for ￥5250 (around $64 USD) and here are the contents that came with my bag. Brown spaghetti strap shirt, retails for ￥4095! Checkered dress ratails for ￥9345! So you see that the value total of the items is..￥20,685 (around $251 USD) crazy! plus you get the free bag. Also, couldn't help to wonder into the "Sale section" which some items were 80% off, so I got myself a floral sweater. The retail price was ￥7245, but got it for ￥1995! I love my new clothes so much! I'm ending this post abruptly here because I'm about to leave for school. I'm totally against the whole Kony 2012 campaign, and before you call me a heartless person, please read and then feel free to judge me. Anyways, I first heard of this whole thing because people were SPAMMING videos from popular youtubers with "KONY 2012" "Stop Kony" "Make Kony famous." I decided to google it, and found the video from Invisible Children, and watched the whole thing. I never heard of this guy before, so I obviously has moved the situation, but honestly, anything that involves kids and animals suffering people will make you feel bad. In the video, Jason Rusell (the filmmaker) is asking everyone to make Joseph Kony famous so that it would be easier to capture him. He is also promoting this "kit" Invisible Children is selling, and is asking for donations. If only awareness would solve the problems in the world, I guess there would no longer be starving children in Africa, no more hungry people in North Korea, no more animal cruelty would exist. Just saying! Posting on facebook, blogging and tweeting about it doesn't help! It has the same impact as you tweeting about how an amazing time you had last night with your friends! None. 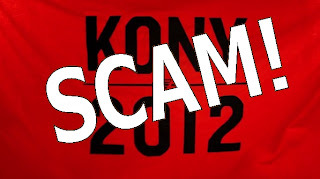 So please, before you make a complete fool of your self spamming your facebook with Kony related posts, and wasting your money in Invisible Children you should educate yourself more and research the company! -The LRA has not been active for the last 6 years! 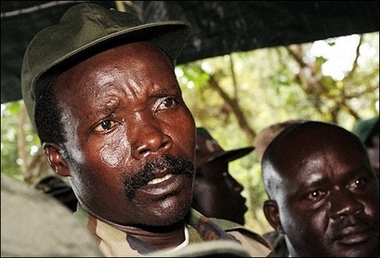 -It is known that Kony is no longer in Uganda, that he is in Congo, and there is even a rumor that he is dead! The US Army, is looking for him in Uganda, seems like it is a waste of resources. Invisible Children is a shady business. It has a rating of 3 star out of 5 in Guidestar.org, the figures I'm about to show you are Invisible Children's expenditures from 2010, you can find them here. Jason Rusell's Salary $90,000 a year! That is a good salary, the guy didn't make the film just because he felt compelled to do it, he did it because it is his job! He is the highest paid employee in the organization! Total revenues in 2010 $13,000,000. Not bad, considering it all comes from grants, donations, and from merchandise they sell to you! Jason Rusell's salary is included in line 5. Want to know how much they spend lobbying? Nada. They don't spend a dime lobbying for the cause, yet they spend a million dollars on traveling expenses. This is the amount of money Invisible Children donated to Africa. Only 16% of their entire revenue. You can deduct that the rest of the money goes to the officers pockets. Yet they are asking for more! It seems to me that majority of the people just watched the video and believed everything the video explained, without looking further into the subject. You can't trust everything you see on the internet people! Jason Rusell was arrested yesterday 03/15/12. Want to know why? He was drunk and masturbating in public... disgusting! During the week I went to Target to pick up a few things I was running low on. I couldn't help to notice this! A super tiny jar of Vaseline, it was only $1.79, so I obviously bought it. This isn't your regular vaseline, it is the "lip therapy" vaseline, but I read the ingredients and they are all the same! Petroleum Jelly. I love Vaseline, because it is cheap, and you can use it for so many things. My favorite kind is the cocoa butter one, it smells so good! One of my favorite uses is lip balm. Here in San Diego, winters are not very cold and dry compared to other places where it even snows. You can pretty much get away with just a cardigan. But my lips suffer during winter, they become so chapped and dry, and Vaseline is the only thing that works during this time. So Vaseline in a tiny jar is good enough for me because, it is so small that i can actually carry this when me. Vaseline can be a bit too thick for everyday lip balm, so I recommend using this at night before you go to bed, and you will wake up with super soft lips.